We are one of the last Family-Owned Jewish Funeral Homes in Delray Beach. We offer unique opportunities for families to create healing moments after loss. Our experience, coupled with our perspective on the importance of ceremony, will help you discover ways to pay tribute. Whether traditional or unique, these tributes allow us to love, laugh, and live well again. More and more Jewish Families are choosing Cremation as an alternative to Burial. 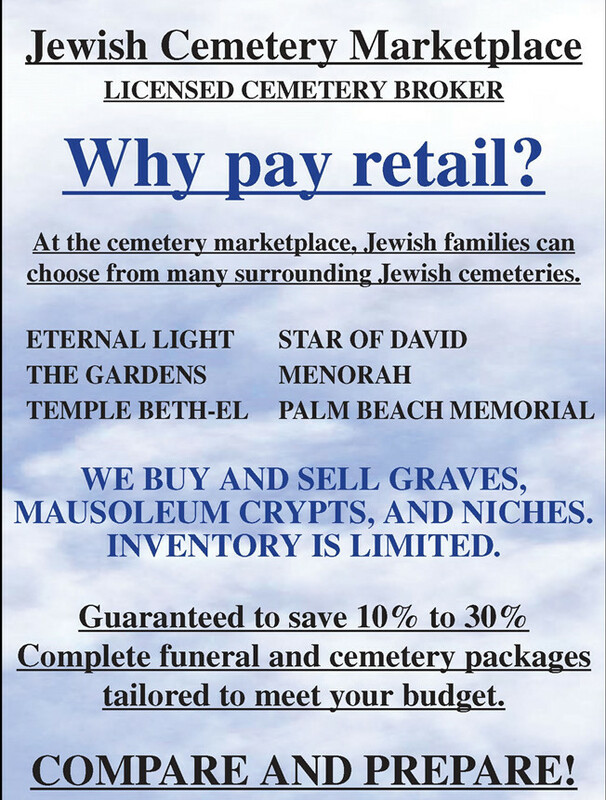 Along with a complete and affordable Jewish funeral, we offer Mausoleum, Graves and Niches at most Jewish Cemeteries in Broward and Palm Beach County. Complete Services including all professional, administration & staff fees, removal from place of death, preparation & dressing of deceased, hearse to cemetery and memorial package. •	Funeral Services – We offer funeral services that can be shaped to any budget or spiritual requirements. Our friendly and understanding staff members will make sure that this difficult time doesn’t become any more trying than it already is. Let our experience help you and your family say goodbye in a spiritual and respectful ceremony. •	Cemetery and Burial Services – We have associations with many different cemeteries around our area, which gives you the choice you need to find the best resting place for your loved one. •	Cremation Services – If you and your family have decided that your loved one will be cremated, our cremation services can offer the professional and valuable service you’re looking for. •	Free Estimates - We offer free estimates on all of our services, so you know exactly how much it will cost for the services you desire.